Traditionally it has always been thought that wired mice are superior to wireless options, particularly for gamers. Wireless mice are known to have click latency issues, which for multiplayer games can be the difference between scoring that well-timed headshot or missing your target and revealing your location. Logitech is now challenging this conception with their G703 Lightspeed Wireless Mouse and its companion G PowerPlay Wireless Charging System, at long last freeing gamers of knotted cables. The G703 Lightspeed Wireless Mouse has a suggested retail price of AU$149.95, so it’s a nice mid-range option for consumers. It includes the mouse itself, a wireless USB adaptor, a braided charging cable and an optional 10 gram weight. The mouse is ergonomically designed, featuring rubber grips on the side for added control. Indeed, during extensive play and normal work sessions it felt comfortable in the palm of my hand. So comfortable in fact, that I could discard the usual wrist rests I use in the office! My only complaint is that the G703 is designed for right-handed gamers only; left-handed players will need to look at getting the Logitech G903 as an alternative as that is designed for both hands. The G703 is very light and practically glides across any flat surface. 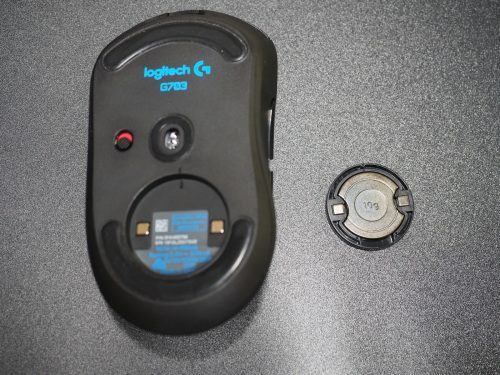 The weight is placed in a magnetic door at the bottom of the mouse, though for nail biters you may have some trouble removing the weight once it is placed. When using the PowerPlay Wireless Charger you will have to remove the weight, as the charger’s power-core module (more about this later) fits into the same space. The real highlight of the mouse though is Logitech’s Lightspeed technology, and I can safely say that Logitech does not disappoint with the G703. Loading up favourites such as Smite, Fortnite, PUBG and a couple of FPS titles, I was able to play the games as normal with a smooth performance. Clicks were responsive and I had no difficulty aiming. You are able to keep using the mouse while charging via USB cable, and it will also continue working with just the cable plugged in and the wireless adaptor removed. Combined with the ergonomic and comfort factor, this is an ideal mouse to use for extended play sessions and is comparable to other high quality products on the market. 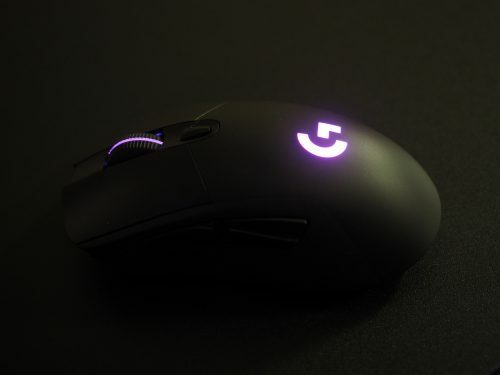 Like other Logitech products, consumers are able to customise the RGB lighting effects of the G703 using the Logitech Gaming Software. Logitech boasts you can choose 16.8 million colour and lighting options, including the brightness level and a few animation effects such as breathing, colour cycling or a simple fixed colour. You can choose to have different settings for the scroller and the logo, such as turning the lighting off for one and not the other and different colours. 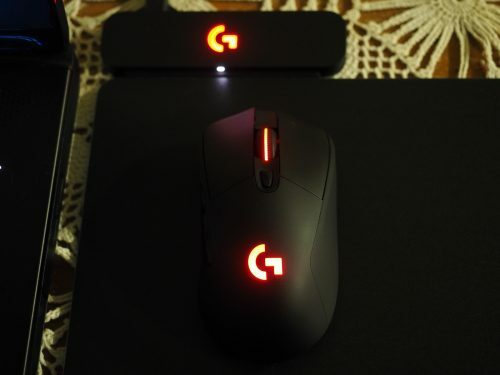 Even better, you can sync the G703 with your other supported Logitech devices, such as the Logitech G512 Carbon keyboard, for a grand light show. 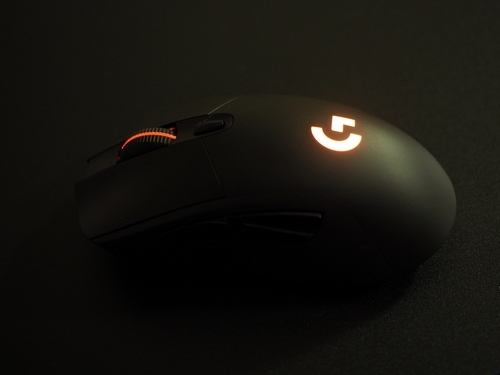 You can program and customise the G703’s six buttons, with there being an option to store multiple settings on either the mouse itself or via the Logitech Gaming Software. You can also change the mouse’s DPI sensitivity and fine tune it’s sensitivity to different surface types. There’s quite a bit to play with here and it should suit most gamers and their setups; it’s obvious Logitech are aiming to appeal to the pro gamer scene here. With default lighting, Logitech promise the G703 can last 24 hours on a full charge or up to 32 hours with no lighting. When I left the mouse sitting idle for a few minutes the lights on the mouse turned off, which is a nice touch for those who are power conservative. Indeed, the battery on the G703 does seem to meet these figures. While I didn’t count the exact hours, I was able to use the mouse regularly without the PowerPlay charger for a couple of days on a single charge. Naturally though, this will vary depending on individual users and if you turn off the mouse by its switch at the end of each day. As I’ve mentioned a few times throughout this review, Logitech’s G PowerPlay Wireless Charging System acts as a companion device for both the G703 and the more expensive G903. The PowerPlay system has a suggested retail price of AUD$199.95 and is a mouse pad that wirelessly charges the mice, though there’s a little more tech than first meets the eye. PowerPlay comes with a base that has an inbuilt wireless receiver, meaning you won’t have to use the standalone adaptor that comes with the G703. Once again, Logitech’s Lightspeed technology is at use here ensuring your gaming sessions are smooth and latency free. 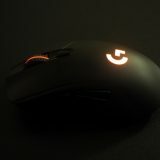 There’s also RGB lighting that syncs with the mouse’s display, or you can choose to customise it separately as well. To utilise the wireless charging features of the PowerPlay system, you will have to insert the power-core module into the magnetic compartment beneath the mouse. The PowerPlay System comes with both a hard and a cloth-based gaming mouse pad, both of which have a solid, quality build and compliment the G703’s smooth movements. The size of the mouse pad area is quite large as well, featuring a length of 321mm and a width of 344mm which should suit most consumers for both games and normal use. PowerPlay’s best selling point is, of course, the fact you’ll never have to worry that your wireless mouse’s battery will go flat in the middle of a game session. 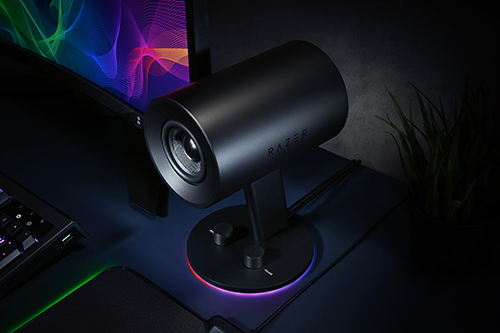 But given its price point it may be a little on the expensive side for some, especially if you’re purchasing it at the same time as either the G703 or G903. It’s a quality mouse pad to be sure, but other than the aesthetics of having matching RGB lighting, the same branding and the promise of always being completely wireless, it’s not a must have accessory. Remember; you can easily charge the G703 using its provided USB cable even if means sacrificing being cord free for a few hours. Get it if you can afford it and are constantly on your PC, but don’t feel like you’re missing out on too much if you don’t pick it up alongside your shiny new mouse. The Logitech G703 wireless mouse is a quality product that comes highly recommended for right-handed gamers. Its light weight, smooth movements and Lightspeed technology make this one the best wireless options available, and the option to tweak various performance settings will directly appeal to pro gamers. The G PowerPlay Wireless Charging System is also a solid product, offering gamers an infinite power solution for their mouse and also being a comfortable gamepad overall. However the PowerPlay’s price tag may be a little expensive for some, especially if you’re looking at purchasing it alongside your shiny brand new G703.